A Discovery Hub® is an architectural construct designed to underpin good data quality and governance for business intelligence (BI) systems based on data discovery tools. It addresses the challenges that arise when data discovery tools, such as Qlik or PowerBI, are successfully adopted and drive business people to forage for source data wherever they can find it. This paper proposes three occasions during the roll-out of BI when it is appropriate to adopt a Discovery Hub. Experience shows that it most often occurs after data discovery has become valuable to the business and when IT is struggling to maintain data quality in the face of business data collection from disparate sources. 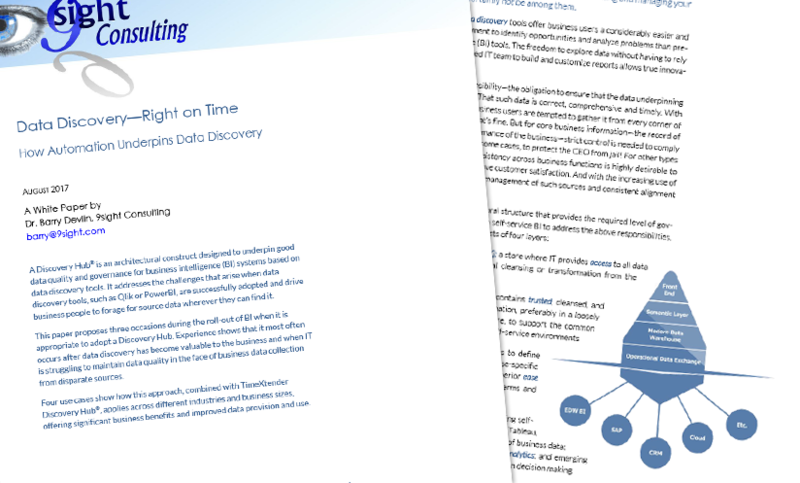 Four use cases show how this approach, combined with TimeXtender Discovery Hub®, applies across different industries and business sizes, offering significant business benefits and improved data provision and use.